What are chances of U.S. electing its 1st woman president? With the emergence of female head-of-state leadership around the world, a question arises: Why hasn't the United States elected a woman president? As a progressive world power, the United States has lagged behind other countries in its inclusion of women in positions of power. This shortcoming was evident last winter. On Jan. 16, Taiwan made history by electing its first woman president, Tsai Ing-Wen, a moderate representative of the Democratic Progressive Party (DPP). She won about 56 percent of the votes, effectively ending the eight-year rule of Taiwan's pro-China Nationalist Party. Tsai accomplished this feat by vowing to invigorate Taiwan's sluggish economy by diversifying trade with other Asian countries and distinguishing Taiwan's identity from China. Tsai believes that although Taiwan's relationship with mainland China is strained, China must respect Taiwan's democracy and maintain the status quo. Tsai has been described as a self-made woman, likened to prime ministers Margaret Thatcher of England and Angela Merkel of Germany. Tsai has not only made history as Taiwan's first woman president, but she is also the first candidate to win the election without a political legacy. The Cornell University graduate joined the DPP in 2004, becoming the party's chairwoman by 2008. She ran for president in 2012 only to lose and resign as the DPP's chairwoman until 2014. After reclaiming her position, Tsai made a second, ultimately successful, bid for the presidency. Taiwan, for the most part, has welcomed Tsai's election with open arms. Her moderate but firm political standing shows that she is a competent negotiator. Many Taiwanese citizens are also eager to see progress for the country's LGBT rights. Overall, the island's younger generation of voters are excited at the prospect of having a woman leader. Taiwan is not the only country to welcome women leaders. An increasing number of countries around the world are electing women as leaders. In fact, 35 countries have had women presidents while 42 countries have had women prime ministers. Hampton University senior Arielle Lewis, a criminal justice major from Philadelphia, believes that the United States' hesitation to elect a woman president stems from deep-rooted sexism and patriarchy. "We would like to think that women can do everything that men can do, but we live in a culture where that doesn't seem like a possibility," she said. "In our culture women are given the secondary role while in other countries and cultures women are given primary roles." Women have been running for U.S. president since 1872, however none of their campaigns were substantial enough to result in an election. Also, many of the women who have run for president in the United States have run as third-party candidates, including notables Victoria Woodhull, and Jill Stein. Woodhull of New York is documented as the first woman to run for president, running 50 years before the 19th Amendment allowed women to vote. Her historic campaign took place during the 1872 election where she campaigned for women's suffrage, political reform, civil rights and social welfare. Woodhull even nominated Frederick Douglass as her running mate, making him the first African-American ever nominated for vice president. Although her campaign was not successful, Woodhull was a catalyst that inspired more women to seek positions of power in the American government. "I didn't even know that the first woman to run for president ran in the 1800s," said Dominique Parrish, a junior, fine arts major from Christopher Newport University. "That isn't something that they taught us in school." Stein's 2012 presidential campaign was largely overlooked. However, ultimately her candidacy was the most successful campaign ever conducted by a woman. Stein ran in the 2012 election as a representative for the Green Party. The environmental health physician's campaign emphasized green jobs and environmental protections. Jill Stein only managed to receive .36 of 1 percent of the popular vote, yet her campaign is considered a milestone. While female candidates have run as third party candidates, a handful sought nominations for major political parties. Shirley Chisholm, who ran for the Democratic nomination in 1972, was the most viable woman candidate for the Democratic nomination until Hillary Clinton. Chisholm made history as being the first woman to have her name placed in the nomination for president at the Democratic National Convention and being the first African American to be on the ballot as a candidate for president. She focused on equal rights and economic justice although her campaign struggled due to being disorganized and underfunded. While Chisholm ultimately did not receive the Democratic Party nomination, she was able to win 152 delegates at the 1972 Democratic National Convention. Clinton, by far, has had the most substantial female campaign for presidency in American history. She has a substantial political background which includes a law degree from Yale University, serving as first lady from 1993 to 2001, serving as a U.S. senator from New York from 2001 to 2009, and serving as secretary of state from 2009 to 2013. Clinton first announced her plans to run for presidency in 2007 and was a frontrunner to win the 2008 Democratic nomination until her campaign was blindsided by U.S. Sen. Barack Obama of Illinois. After much speculation, Clinton announced that she would again be running for the Democratic presidential nomination in the 2016 elections. The former secretary of state is considered the front runner against U.S. Sen. Bernie Sanders of Vermont. As of April 28, Clinton had 1,662 of 2,383 delegates needed for the Democratic nomination according to projects.fivethirtyeight.com. If she can maintain her lead, Clinton will be one step closer to possibly being the first woman president of the United States. Scripps Howard Students Enjoy Third Annual Media Trip to Washington, D.C.
Twenty-five students and five faculty members of the Scripps Howard School of Journalism and Communications traveled to Washington, D.C. for its third annual media trip. Boarding the bus before sunrise, the students embarked on the trip, anticipating the opportunity to glean knowledge from and network with media professionals. "I started the media trip three years ago, and I asked Professor [Sheila] Douglas to do all of the logistics," said Professor Rosalynne Whitaker-Heck, the Assistant Dean of Academic Affairs. "I thought it was important for the students to see professionals at work, and I also thought this trip would open the door for [potential] internships." The first event consisted of two-panel discussions at Gannett USA Today. The panelists consisted of individuals in the media industry including columnists, editors, and producers. They encouraged the students by sharing their personal experiences and challenged them to be innovative and creative thinkers. They also discussed the importance of developing a personal brand by infusing excellence into all of their work. Panelist Tory Hargro spoke about the difference between journalism as a hobby and a craft. He said, "Everybody can report, but not everyone is a good writer consistently. Everyone can take a picture, but not everyone can take a good picture consistently. Acts of journalism can be completed by everyone, but journalism as a craft can only be completed by journalists." Dr. Kangming Ma enjoyed the session and appreciated the discussion about the importance of multimedia. "Multimedia is very important. I observed that the discussions correlated with what I teach in my classes." After leaving Gannett USA Today, the students dispersed into four groups and traveled to different locations including Bloomberg BNA, Hager Sharp, WTOP FM radio station, and WUSA TV 9. Bloomberg BNA is a global business financial information news leader. Freshman broadcast journalism major Terrell Snead found the trip to be very informative. "I learned that [Bloomberg] is a main source to professionals, such as lawyers or individuals who work for government agencies." Hager Sharp is a public relations firm that specializes in topics such as health and safety. Professor Allie-Ryan Butler chaperoned the students who traveled to this location, and he is confident that the students were impacted by their visit. "The tour guide was a Hampton alumnus, and I think that gave the students the chance to see themselves 10 years after graduation. And the discussion was consistent with Hampton's current mission to address health disparities in our community." Ballah Boakai, a junior broadcast journalism major, traveled with the group to WTOP-FM radio station. He said certain elements from the discussion reinforced his knowledge about the operations of radio stations. "I learned [that radio stations] work as a unit. Every job is somehow connected to another one and in order to work there, you really have to know how to do everything." The students who toured the WUSA TV 9 received a tour of the facilities and news studios, briefing about the equipment and a question-and-answer period with producers. Senior broadcast journalism major Lauren Kendrick said, "I'm getting ready to graduate, so it was really great to see how a TV station in a larger market is operated." After touring the various media sites, the students enjoyed shopping and dining at the Chevy Chase Pavilion before returning to Hampton. The Media Trip was a success and a great opportunity for the students to enhance their knowledge. 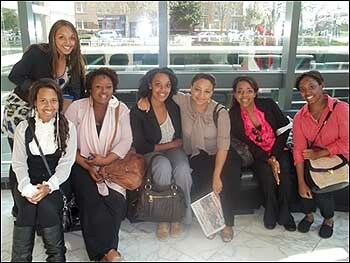 This trip was an opportunity for the students to network and be inspired. They were also enlightened by professionals who are employed in careers in television, newspaper, radio and public relations. The information and encouragement the students received during this trip will prove to invaluable assets that can be integrated into the classroom experience. 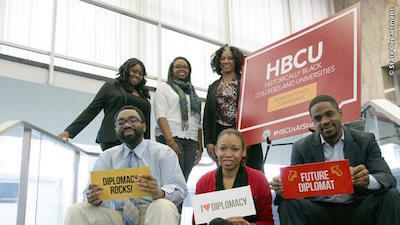 2012 Historically Black Colleges and Universities Foreign Policy Conference at the U.S. Department of State. Secretary of State Hillary Clinton was overseas yet she delivered a 3-minute video greeting at the start of the four-hour, seven-session event. Presenters briefed students and faculty on the "Arab spring," U.S.-China relations that included the 100,000-Strong Initiative and the U.S. Global Health Initiative. State Department experts encouraged visitors to ask questions and there were at least 30 audience queries. Raymond Smith, freshman, St. Augustine's College, math engineering: "I am very pleased with the turnout and very impressed with the speakers. From this experience I hope to become more globally aware. This also gives me more networking opportunities." 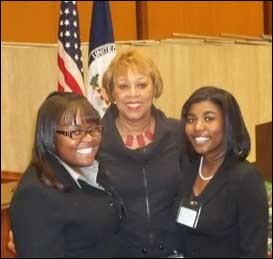 Jasmine McElroy, sophomore, Howard University, marketing: "[I came for] networking. I co-founded an organization called Diversity First in partnership with the CEO of the National Diversity Council. [I look forward to] networking opportunities for myself and others." Alvin Williams II, senior, Elizabeth City State University, political science: "I like that we get to ask questions and that they're responding. I'm going to take the Foreign Service exam. I had never thought about it. " Shannon Crowner, junior, Bowie State, history: "The reason why I decided to come to the conference is because I am interested in international relations and foreign policies. I also felt that it a great study abroad opportunity. I really enjoyed hearing [Deputy Secretary of State] William Burns speak. He has worked for the Department of State for a long time and I could see he is really passionate about it." Michael Brown, freshman, Bowie State, sports management: "By attending this conference, I feel that it is a great way for me to educate myself more about topics here today that I did not know about."